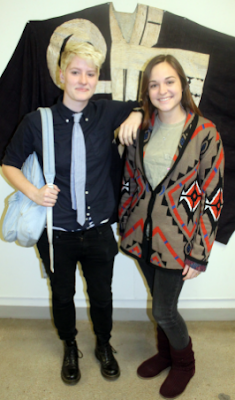 Design students, Lauren and Shannon, take time in between classes to strike a pose. Lauren's androgyny comes together through the light blue-dark blue color scheme complete with an American Apparel tie, strong Doc Martens boots, and a daring, angular haircut. Shannon keeps her look simple but interesting with a vintage Navajo-print sweater from Beehive.